Built on a bluff overlooking Watson’s Creek, the Isaac Watson House was built in 1708, and is recognized as the oldest house in Mercer County. It serves as the headquarters of the New Jersey State Society of the National Society of the Daughters of the American Revolution and was restored by NJDAR in 1964, as part of the New Jersey Tercentenary Celebration. Isaac Watson was the son of Quakers who came to this country from England in 1684. The furniture now displayed in this fine stone house antedates 1790, and several pieces were made by New Jersey craftsmen. 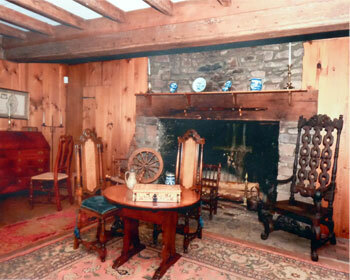 In addition, many articles in the home were donated by New Jersey Daughters. 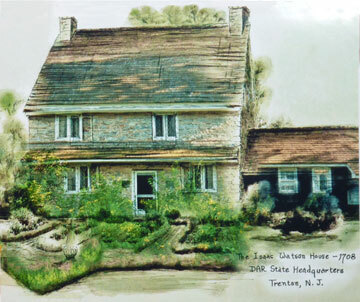 The Isaac Watson House is located at 151 Westcott Ave., Hamilton, NJ. Watson House is easily accessible from Route 206, heading towards Trenton. Bear left through the White Horse intersection, and stay in the left lane (South Broad Street). At the fourth traffic light, turn onto West Park Avenue. Continue through two stop streets, then make a left turn onto Westcott Avenue. After passing under high tension wires, make an immediate right turn onto the lane that leads to Watson House. Parking is available in the parking lot, inside the chain link fence. Please contact us via email for private or group tours.